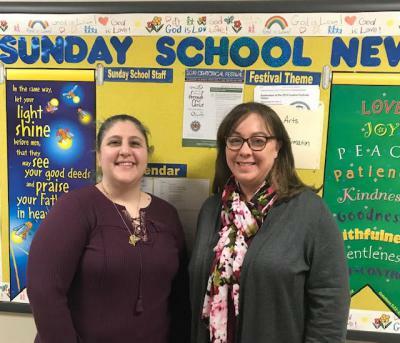 Jennifer and Samia have been co-directors of the Sunday Church School at Ss. Peter and Paul Antiochian Orthodox Church in Potomac, MD, for 10 years. They have actually been friends for over 25 years! They even co-taught the 2nd-3rd grade Church School class for 3 years, including their first year as co-directors. Please share with us a little about yourselves and the Church School Program. How long have each of you served as Church School Director? Please describe how the Church School program responsibilities are divided and shared between co-directors. This is our first interview with co-directors, and I am very interested in learning. When we began as directors, we split our duties where Samia would be the contact person for the priests and teachers and Jennifer would take care of the paperwork, registration, emails and newsletters. Now we both jump in and do whatever needs to be done. This helps when one of us is really busy with our families; there is someone that can take over for the other one. We love working together. We can plan together, brainstorm together and support the teachers. It also allows one of us to help out in a class when needed and leaves the other one in the office to be ready to answer questions for parents or church members. How many students attend Sts. Peter and Paul Church School? We currently have 106 students registered. We have approximately 70 students each Sunday. How is the program organized for Sunday classes and how many teachers are assigned per class? Which curricula is used for Sunday classes? We use a variety of resources such as from the Antiochian Archdiocese, OCEC, and the Greek Orthodox Archdiocese Department of Religious Education. Are there ways in which you encourage consistent attendance (incentives, communication with parents, etc.)? To encourage attendance, we give students a ticket each Sunday that they attend Church School. For our Preschool-5th grade students, the tickets are saved in a baggie with their name on it. Approximately three times each year, we have our Sunday School Store. The students will “spend” their tickets to purchase items. We price the items so that even a visitor that has 1 ticket can still “purchase” something. Some of our items include religious tattoos, religious pencils, erasers, small stuffed animals, kaleidoscopes, Bible coloring books and bubbles. We purchase items from Oriental Trading and get donations. Students can save tickets for the next store. We do not allow saving to the next year. Our middle and high school students put their names on the back of their tickets and place them in a box. Every other month the teacher will draw two names to win a $5 gift certificate (we ask the students what kinds of gift cards they would like at the beginning of the year.) When names have been drawn, then the remaining tickets are thrown out and the classes start over. Does Sts. Peter and Paul Church School celebrate any unique events such as Godparents Sunday, Birthdays, Holy Week traditions, Patronal Feast celebration, annual SOYO events, Creative Festival Awards Ceremony, field trips, year-end celebration, or other? If so, please describe. We hold two workshops each year. Our Saint Nicholas Workshop is held at the beginning of December. On that Sunday, students come down from Liturgy and we have a pizza lunch. Then students complete 3-4 different crafts. The crafts change year to year. Some of the crafts have been clay bells, cinnamon dough ornaments, reindeer food, edible Christmas trees and votive candles. The last few years, we have incorporated a service project for our students. This year we asked students and families to donate toys to a local organization for children. We have also collected hats and gloves for children. The Sunday before Palm Sunday, we have our Pascha Prep Workshop following the same format as our Saint Nicholas workshop except the crafts are related to Easter. One craft that is so popular every year is our candle craft. Students will take a white candle and use floral tape to wrap artificial flowers around the candle. Students will use the candles during the Palm Sunday procession and during Holy Week Services. We also have held service projects for this workshop including food drives and collecting supplies for the IOCC Hygiene Bags. At the end of the year we recognize our High School Seniors and present them with a small gift. On the last day of Sunday School, we recognize all our students and teachers. We present the students with an icon card. We have an ice cream sundae celebration following Liturgy. What is one piece of advice each of you would share with fellow Church School Directors? Jennifer: Ask for help; be willing to accept help. Samia: Communicate on a regular basis with the priest(s) and the parish about your program.